home → Loans → Car Loans → Is Paying Off a Car Loan with a HELOC a Good Idea? Is Paying Off a Car Loan with a HELOC a Good Idea? Paying off car loan debt is usually at the top of a lot of people's priority lists. They look at their car loan payment and wish that they could alter it somehow. One way to do this is through a home equity line of credit. Many people take out a HELOC and then pay off all of their debt with it in order to consolidate everything into one place. While this can work under the right circumstances, it may not always be in your best interest to include your car in the HELOC. Here are a few things to think about when considering paying off your car loan with a HELOC. Payment flexibility--When you pay off your car loan with a HELOC, you are giving yourself a lot of payment flexibility. This can come in handy when uncertain times are ahead financially. With a HELOC, you only have to pay the interest on the loan each month. If you do not want to pay down the balance one month, there is nothing that says you have to. Therefore, if you have a bad month, you can just pay the interest payment which will most likely be smaller than what your car payment was. This can come in handy when you have an income that is not exactly steady. Change your terms--With a car loan, you have a set amount of time to pay the car loan off. In many cases, you will have a fixed payment every month for five years until the car is paid off. However, with a HELOC, you can actually change the amount of time that the loan is open. Your HELOC will usually be available for 10 to 15 years. Therefore, if you want to double the amount of time that it takes to pay off the car, you can do so. This can drastically lower your payment each month and give you greater flexibility with your monthly obligations. When you are living on a budget, having flexibility with your terms can help you out drastically. 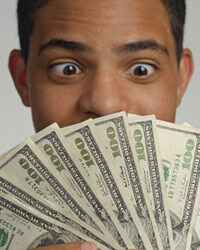 Tax advantages--Perhaps the biggest benefit of using a HELOC to pay off your car loan is that you get a tax deduction. Interest paid on a HELOC is generally tax-deductible. Interest paid on a car loan is not. Therefore, you will be saving money on your taxes at the end of the year. Risking your house--You are essentially putting your house at risk for a car payment. Your house is much more important than your car in the grand scheme of things. Variable rate--HELOCs are usually variable rates, which means your payment could fluctuate. If you plan on living in your house for many years, this is a good idea. However, if you may need to move in the near future, it could put you upside down on your mortgage loan when you try to sell. Just evaluate your current situation and make the best decision based on your needs. Negotiating the Best HELOC Rates and TermsWhat is a 100% HELOC (Home Equity Line of Credit)What is a HELOC?What is a Stated-Income HELOC?